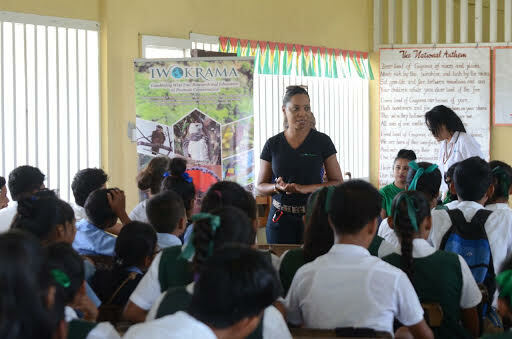 Iwokrama along with colleagues this week continued environmental outreach activities to mainly secondary school students of St Rose’s and St Cuthbert’s Mission (Pakuri Village). 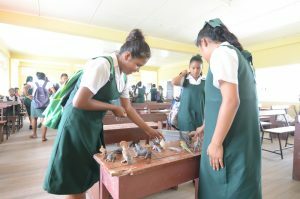 These activities also are geared to educate students about career opportunities that are available in the exciting field of conservation and also moving Guyana towards green development. The teams interacted with over 200 students and their teachers sharing information on Iwokrama’s work in conservation, research and business development. The participants viewed videos and presentations on protected areas, climate change and the importance of taking care of the environment. Iwokrama staffer, Vanessa Benn emphasized the harmful effects of littering and the need to carefully manage resources including energy. 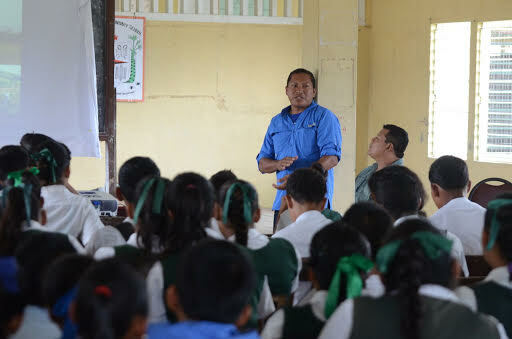 Also on board were partners including the Guyana Society for Biodiversity and Ecosystems (GSBE), a local non-governmental organization whose mission is to promote the conservation of Guyana’s biological diversity, and the North Rupununi District Development Board (NRDDB) which represents the interests of the 20 communities of the North Rupununi and implements projects for the benefit of its people. Discussions also focused on how communities like St Cuthbert’s can benefit from sustainable logging and eco-tourism using the examples of Iwokrama’s logging and tourism businesses. Lakeram Haynes, Village leader of Kwamang Village and NRDDB representative also spoke about community development in North Rupunuuni including community tourism and showed them presentations on the Rewa and Surama eco-lodges in the North Rupununi. 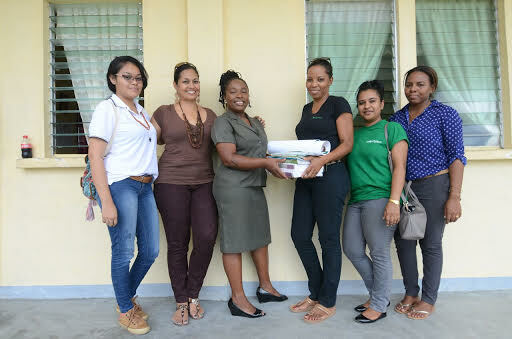 At St Cuthbert’s the team handed over posters, books and flyers which were received from the World Wildlife Fund-Guyana (protected species), Environmental Protection Agency (solid waste management and biodiversity), Forest Products Development and Marketing Council of Guyana (Timber Trade and Investment Magazine), Tourism and Hospitality Association of Guyana (Explore Guyana – Tourist Guide of Guyana 2017), Guiana Shield Facility/United Nations Development Programme (Biodiversity of the Guianas) and Conservation International Guyana and Iwokrama (Climate Change and The Role of Forests – A Community Manual). Both outreach activities were due to collaborations, the St Rose’s one being with Selwyn Collins of the Conversations with Selwyn (CWS) Programme and was part of the Give Back Tuesday of the CWS 5th anniversary celebration. Located 65 miles up the Mahaica River in Region 4, St Cuthbert’s Mission suffered extensive losses to farms and personal property due to floods in 2011. The community of nearly 1,500 residents mainly of Arawak origin, is popularly known for the spectacular work of its Lokono artisans, the basketry of its women and of renowned artist and archeologist George Simon, Oswald Hussein and other artists.